A few weeks back I was prepping for an upcoming class and had to go to three different stores to find a can of pumpkin puree. The only kind I could find was an organic one that cost $4 for 15 ounces. I did a little research and found there was a pumpkin shortage back in 2009 due to an extremely wet pumpkin growing season, but that doesn’t answer my question as to why there is no pumpkin on the shelves now. I am wondering if it might be due to the fact that I don’t normally buy pumpkin until November when I start making pies. Maybe I am just shopping for it too early, but at any rate I decided I would make my own pumpkin puree in a large batch and freeze it in 15 ounce portions (just like the small cans). This is the perfect amount of puree for pumpkin muffins or double it for a 9″ pie. My brother-in-law, Jason, grew a rather large garden this year and planted a bunch of sugar pumpkins. So lucky me, I have a free supply of pumpkin! I sent my husband over to pick some for me and he came back and said he picked the largest ones he could. Unfortunately, that wasn’t quite what I was looking for. I want small sugar pumpkins for baking, because I find they are sweeter. My husband’s thought process went something like this, “geez, think of how many pies you can make with this one pumpkin!” So, look for pumpkins that around 8-10 inches in diameter and remember that not all small pumpkins will taste good in a pie. Sugar pumpkins have a smoother and less stringy flesh than a decorative pumpkins. They will usually be marked specifically as sugar or baking pumpkins. 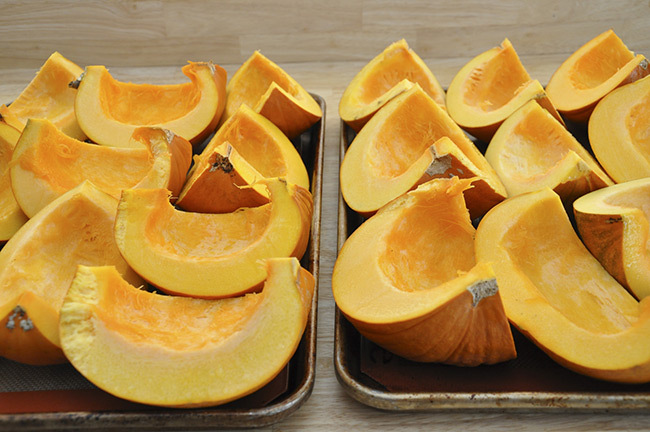 Cut your pumpkins into quarters and scoop out the strings and seeds. You can save the seeds for making toasted pumpkin seeds, but unfortunately no one in my house likes them so they get tossed into my compost. Place the quartered pumpkin pieces onto a rimmed baking sheet that is lined with parchment or a silpat (this make clean-up a hell of a lot easier). You can place them cut side up or down, I find it doesn’t really matter. I placed mine facing up. Bake for 1-1 1/2 hours or until a knife inserted slides in without resistance. Allow to cool for at least 30 minutes, but preferably an hour. This allows the juices to move back into the baked pumpkin and makes it easier to handle while you try to separate the flesh from the skin. Remove the flesh of the pumpkin from its skin. I like to do this by peeling the skin off with a pairing knife, but you can scoop it out with a spoon if you prefer. Puree the flesh in batches in a food processor or a blender. I used a processor and it went very quickly. You want it to be really smooth and rather thick. If it is like paste add a tablespoon of water at a time to it until it is thick, but not like paste. If you find it to be very watery line a colander with damp paper towels or two layers of cheese cloth and allow the pumpkin puree to drain until it is the right thick consistency. Place the puree into small freezer bags. I weighed mine out into 15 ounce portions or about 1 3/4 cups. Then freeze the bags lined up on a sheet pan (this just keeps them orderly while freezing). Once they are completely frozen you can store them however you want in your freezer. I allow the pumpkin to thaw in the refrigerator the night before I plan on using it. Keeps for 6 months or longer. Thanks for the tip Toby, I wondered about processing the flesh and skin together myself. I am sure that it impacts the color very nicely. Libby’s is usually readily available in the Northeast and they still say 100% pure pumpkin on the label.